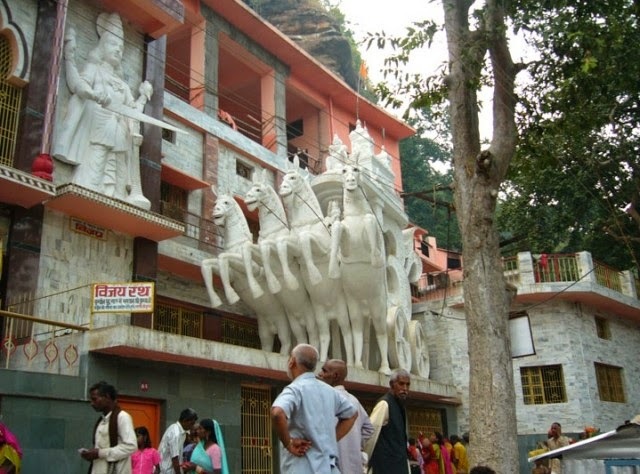 Sati Anusuya Ashram, dedicated to Maharshi Atri and his wife Sati Anusuya, is located about 16 km from the center of the Chitrakoot town in a dense forest area. 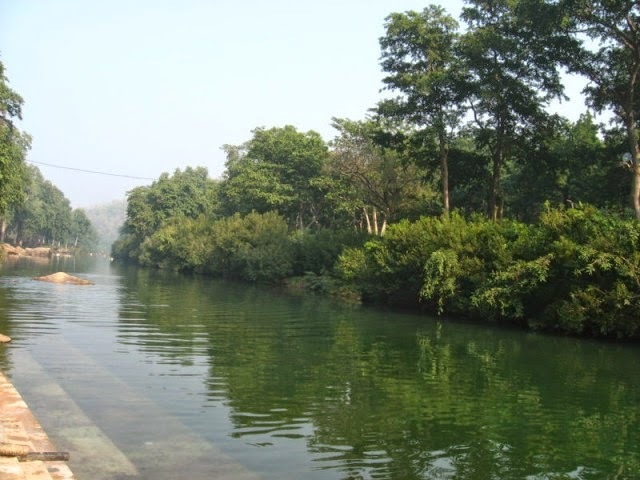 Sati Anusuya is upstream from Janaki Kund. To reach here, you have to take the main road from Chitrakoot to Satna. After Bharata left for Ayodhya, Rama no longer felt like staying on at Chitrakoot. 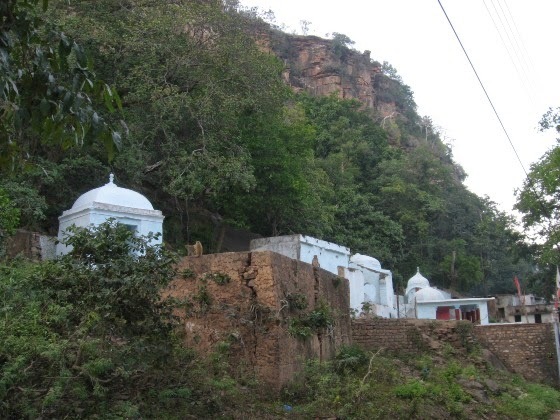 Taking Sita and Lakshmana with him he went to the hermitage of the sage Atri. Sage Atri and his wife Anasuya, who were both wonderful people and had been meditating for years. In fact, they were both quite advanced in age when Rama, Lakshmana and Sita arrived at the hermitage. Anasuya was so pleased to see Sita that she insisted on granting her a boon. Sita said, "Mother, I am really happy to think that you are pleased with me and it is the best thing I could have asked for. I don't need anything else." But Anasuya did not listen to her protests and gave Sita a beautiful Saree, a set of exquisite jewellery, a garland and some cosmetics. All these things, apart from being gorgeous, also had a special quality. Anasuya told her that none of them would ever dim or get dirty with use. (After abducting Sita Mata, Ravana had kept her in the 'Ashoka Vana' in Lanka. During this period Sita Mata used the saree and jewellery offered by Anasuya. She met Hanuman in the 10th month of her confinement in Ashoka vana. For 10 months she had not taken bath. She did not take bath even for the sake of doing the Homa. She was unclean that is, had not taken bath ever since she was abducted.) 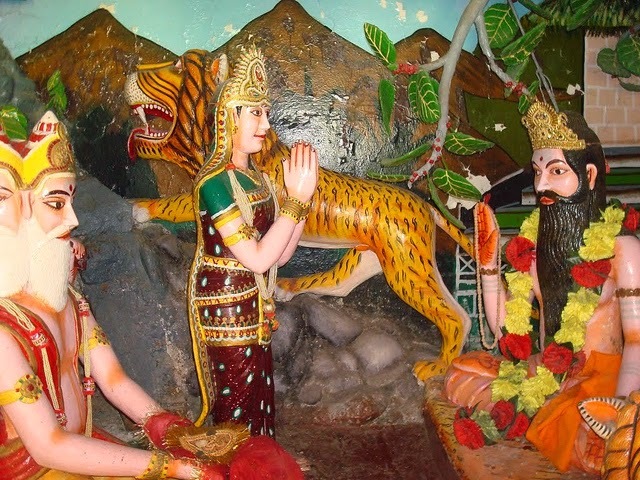 Both Atri and Anasuya were very attentive to Rama, Lakshmana and Sita while they stayed at their hermitage. The next morning they left for a forest called Dandakavana. 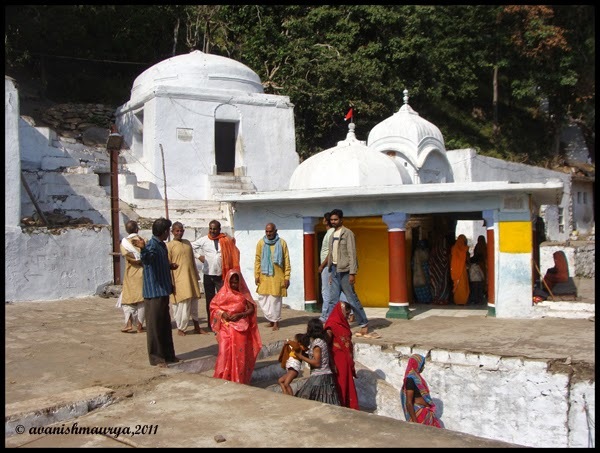 Anusuya Ashram on the banks of sacred River Mandakini, where Devi Anusuya and her husband Rishi Atri, one of the saptarishis (seven sages), lived here. And she preached Sita Devi about being a devoted and good wife. Anasuya advised Sitadevi about the importance of "Pativrata Dharmam" and instructed her to abide by it always. Atri maharishi was the foremost among the 'Dasa-prajapathis' created first and one of Marichi, Atri, Angiras, Pulastya, Pulaha, Kratu, Vashista - the saptarishis. Atri used to drink Ganga water in one mouthful, hence the name. Anusuya means one without jealousy. 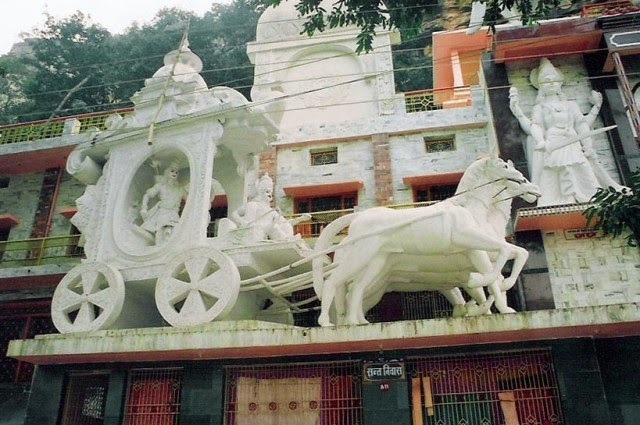 The whole ashram has sculptural depiction of scenes from Ramayana and the life of Sati Anusuya. The Story of Mandavya Muni: In very past there was Brahmin named Mandavya lived in the kingdom of king Karnakarnika. This story visualises how an innocent becomes a victim of punishment. 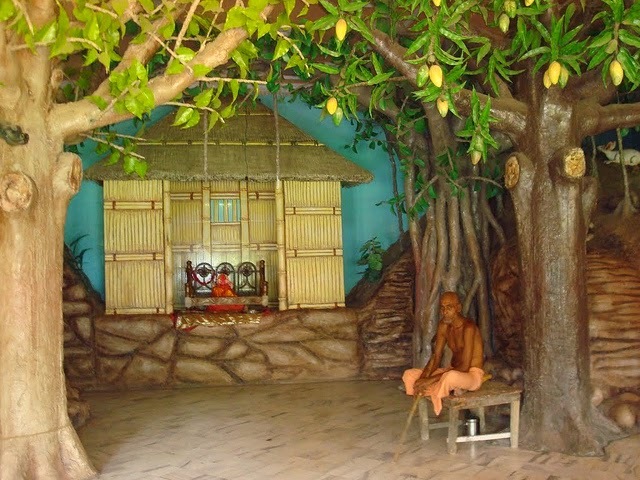 As he was a brahmin, a firm believer in God, he erected an Ashram in front of his hut. There he started his prayer. A peculiarity for his prayer was that he prayed by not chanting or murmuring any mantras. The prayer was Mouna Vratham (Vow of silence). Once while he was praying in front of his Ashram in Mouna Vratham lifting his hands up, the life turning incident happened. Some thieves who stole valuables from king's palace began to run with the valuables and soldiers started to chase them. Finding no place to hide the stolen valuables, they happened to see this empty Ashram, being the brahmin was out. They kept the valuables there and ran away. At last in the search, the soldiers caught them along with valuables from the Ashram. Finally the soldiers came in a conclusion that the Mandavya was also a partner. They all were brought before the king in the the open slaughtering place and were sentenced by king to pierce soolam (trident) through the body until death occurs. With in a few days after the thieves all died. Mandavya alone was alive. Lord Siva appeared before him and blessed him that "Mandavya Live Long". For a long period Mandavya was with the soolam and didn't die. Many Rishis came there attiring in the form of birds and animals and enquired about his state of comfort. King finally knew Mandavya was innocent and ordered his soldiers to get him down from the soolam. But they were unable to take off it. So they Sow the Soolam otherwise called Ani, to free his body. As the balance of Ani was with his body, he was called Ani-Mandavya. Thus innocence escaped him. When Ani Mandavya lay on the tip of trident another event happened. 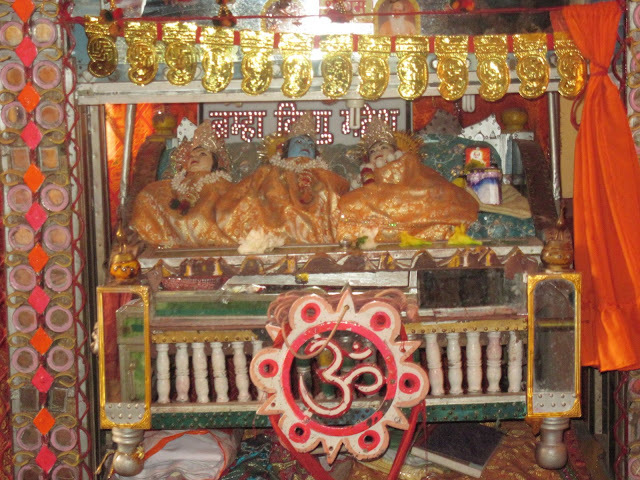 Silavati was wedded by sacred Sanysi Ugrasravas, son the Veda famous Athri Maha Muni. Due to a curse Ugrasravas became a lepor. So that he could not go for begging out side alone. Silavati used to take him along with in a big round basket paved with soft cotton and bed sheet and carry him on her shoulder. One day Ugrasravas expressed his deep desire to go to a prostitute's house and insisted her. As Silavati was so pious to her husband and was doing Tapas to get cure the illness of him, it tempted her to take him to the house. While taking him to the prostitute's house, she wanted to pass through a place where Ani Mandavya, a Sanysi, was hanged on a Soolam. While passing, the head portion of Ugrasravas touched at the feet of Ani Mandavya. Due to the unbearable pain, Ani Mandavya cursed Ugrasravas that his head may broke at Sun rise. Hearing this frightening curse, Silavati returned and cursed that "Sun should not rise again". As she was so pious the total Universe stopped to move then onwards. Next day the sun did not rise. All activities came to a standstill. At last the gods approached Atri Muni. They induced Anasuya, Atri's wife to persuade Silavati to withdraw her curse, but Anasuya wanted a child in return as she did not have one. The trimurthis blessed her to have a child and said they themselves will be born to her as a child, then Anasuya consoled Silavati and let Sun proceed in his course. After many days of this incident another event occurred as follows. 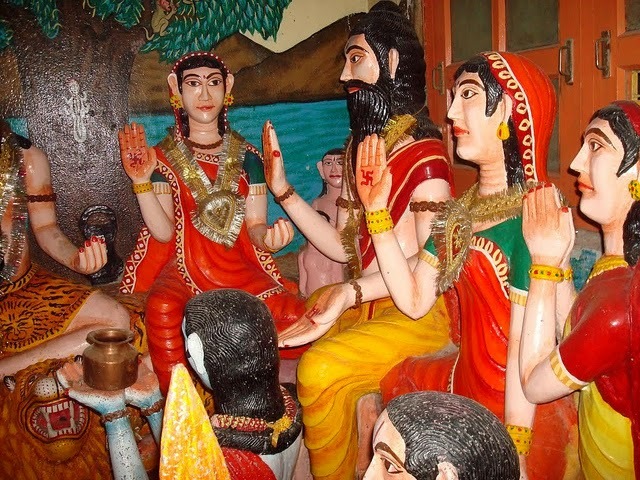 Trimurti tested Anasuya's chastity: Atri’s wife Anasuya was the daughter of Devahooti and Kardama Prajapathi. Anusuya was very loving and devoted to him. She was a “Pativrata” (Pativrata means one who is loyal and faithful to the husband). 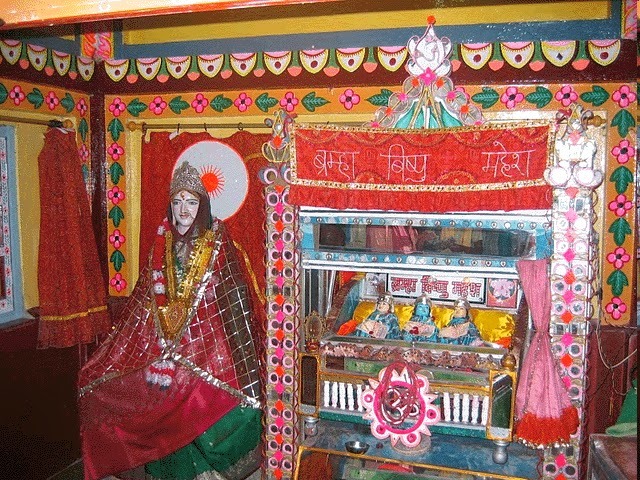 Sage Narada visited Rishi Atri’s ashram and was very impressed with Sati Anusuya’s loyalty, dedication and devotion to her husband and praised her in front of Goddesses Saraswati, Lakshmi and Parvati the wives of Gods Brahma,Vishnu and Shiva respectively. The Goddesses were jealous of Anusuya, so they decided to test her loyalty. They came about a plan. The 3 Gods went to Rishi Atri’s Ashram as guests, when Rishi Atri was not there at home and asked Sati Anusuya to serve them (lunch) without putting on any clothes. Sati Anusuya agreed to this, she meditated upon her husband and sprinkled water on them and converted them into 3 babies. The three goddesses who were waiting for their husbands to come back arrived at the scene to find their husbands being converted to babies. They immediately regretted their plan and asked Sati Anusuya to forgive their husbands and themselves. Sati Anusuya forgave them but asked for the three Gods to be born as her 3 sons. "The gods were then born to her as her sons Soma/Chandran (Lord Brahma's qualities), Dattatreya (Lord Vishnu's qualities) and Durvas (Lord Siva's qualities). 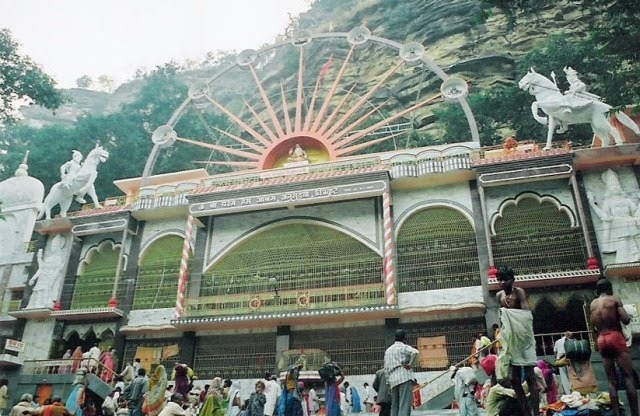 The big temple just in front of the ghat was made by Paramhans Ashram trust. The original small temple is some 200 meters away from this one. But very few people go there,may be due to unawareness. They visit the first temple of trust and return back. We are going to start from Chitrakoot and going to enter the dense forest.